Milo loves to sleep in baskets of laundry. 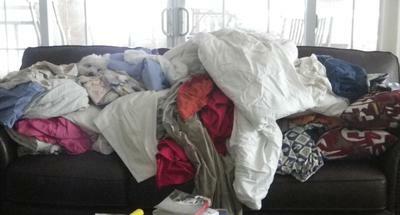 This pile of clean sheets on the couch,ready to be folded, must have been too tempting to ignore. How he jumped up there I'll never know.Can you spot Milo? What an adorable picture. Their never is a shortage of cute pics with these dogs. You sure look comfy Milo!!!!! So cute and you little gems are always keeping us smiling. Too funny, and very cute. Gotta love 'em!